Established by IMS to honor the seminal contributions of Professor Ken Anderson to bench to bedside translational research. 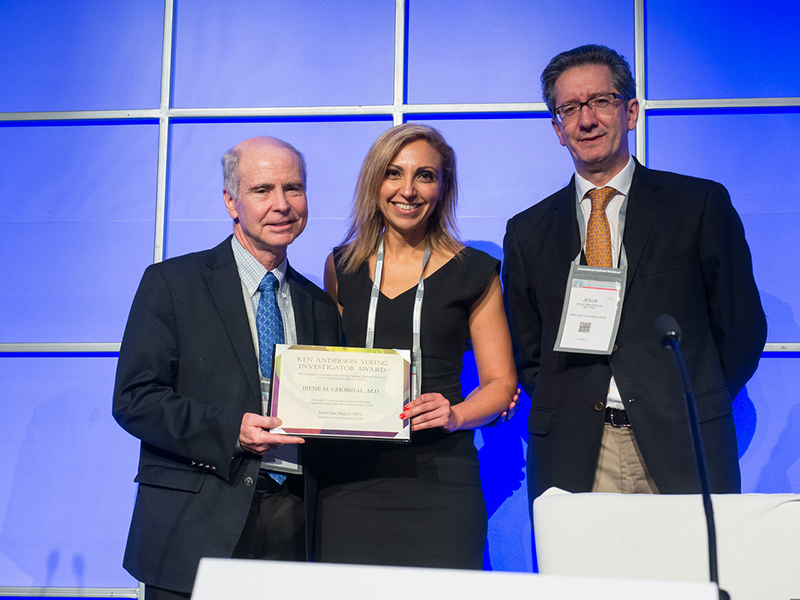 The Young Investigator Award will be given to an investigator under the age of 45 years to both recognize and stimulate excellence in myeloma research. An Award of US $25,000 by the IMS will be given at the International Myeloma Workshops, beginning with India in March 2017. Be members of IMS in good standing at the time the application is submitted and remain a member of IMS in good standing for the duration of the award funding period. Please see our membership page for more information or contact adminassistant@myelomasociety.org. Age: Less than 45 years by the first date of the Workshop. The 2019 application period will open January 7, 2019. Only electronic email submissions will be accepted. Personal data: Date of birth, institution, your current position and name of the director of your research. Research: number of publications specifying original papers, reviews, book chapters, any consensus statements and number of abstract presented at international meetings. List your 10 top publications in which you are first or senior author. Each eligible nomination will be reviewed by the current members of the International Myeloma Society (IMS) Board and members of the Award Subcommittee who hold current membership in the IMS. The members of the IMS Board and the Award Subcommittee will be the electors by voting for only one applicant. Any member, who are directly linked to the applicant will have access to the applications but will not be involved in the voting process. The awardee will receive $25,000 which can only be used to support the awardee’s myeloma research. The award will be presented at the next International Myeloma Workshop. If selected for an award, the recipient will agree to cite support from the International Myeloma Society (IMS) in any publication resulting from the research conducted during the award period. Research award funds cannot be deferred and are non-transferable. This award gift does not allow for any indirect costs. A summary of the research conducted within the two years following the Award must be submitted as a progress report to the IMS Board. If you have any questions or require additional information regarding the Ken Anderson Young Investigator Award, please contact adminassistant@myelomasociety.org. 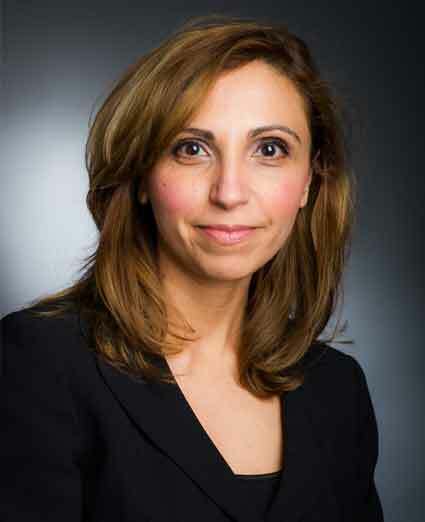 Dr. Irene Ghobrial is an Associate Professor at Dana-Farber Cancer Institute (DFCI), Harvard Medical School, Boston, MA and an Associate member of the Broad Institute, Cambridge, MA. She is the director of the Michele & Stephen Kirsch Laboratory and co-director of the Center for Prevention of Progression (CPOP) at DFCI. In addition, she is the co-leader of the Blood Cancer Research Partnership (BCRP), a consortium for innovative clinical trials of community oncology sites coordinated by DFCI. She received her medical degree from Cairo University School of Medicine, Egypt. She completed her internal medicine training at Wayne State University, MI, and her hematology/oncology subspecialty training at Mayo Clinic College of Medicine, MN. Her research focuses on understanding mechanisms of tumor progression from early precursor conditions such as monoclonal gammopathy of undetermined significance (MGUS) and Smoldering disease to symptomatic Multiple Myeloma (MM) and Waldenstrom Macroglobulinemia (WM). She specifically focuses on the role of the malignant bone marrow niche in regulating disease progression. She is interested in the development of new molecular/genomic markers that predict progression in precursor conditions which can identify patients who should be eligible for therapeutic interventions to prevent progression or potentially cure the disease at the early stages of the disease before clonal evolution occurs. She authored or co-authored over 250 publications and book chapters and has received funding support from the National Cancer Institute as well as multiple foundations including Leukemia and Lymphoma Society, Multiple Myeloma Research Foundation, Stand Up to Cancer and International Myeloma Foundation. She has received multiple awards including membership in the American Society of Clinical Investigation (ASCI), Robert A. Kyle Award for Research in Waldenstrom Macroglobulinemia, and Mentor of the Year Award at DFCI in 2014. You are invited to become a member of the International Myeloma Society. Any person who is, or has been, engaged in research, teaching, or practice in connection with multiple myeloma or related disorders is eligible for election as an active member. Stay updated on our workshops.